Huronia Chapter - Ontario Archaeological Society: Canals and Water Level. 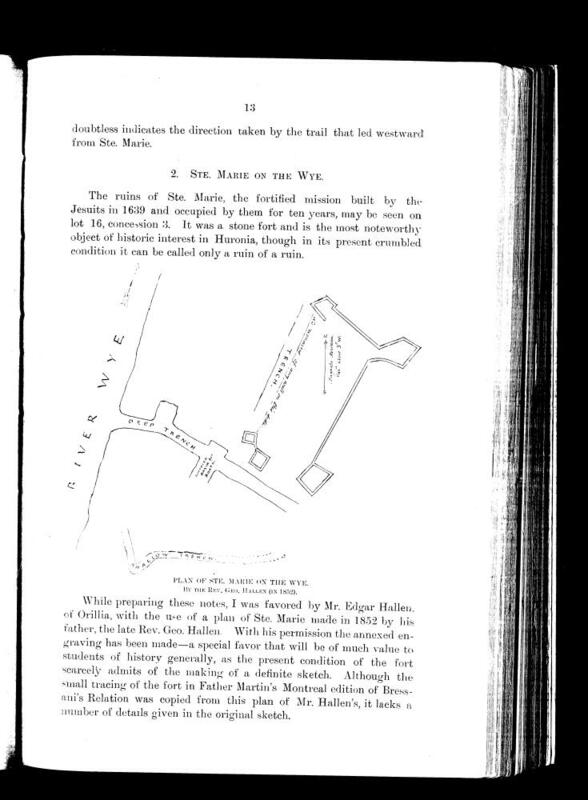 This site plan of Ste Marie l done by Rev Hallen in 1852 shows the large trench or canal flowing freely to the Wye River and probably fed by the smaller North South trench directing the spring water from the hill where the Shrine now sits. I believe that the "canal" was filled with river water and the other drainage ditches flowed into it. I doubt that there were any locks as suggested by Jury. They would not have been required if the Wye River (Georgian Bay) water levels were up by 10-12ft over current levels. The current program at the Ste Marie site leaves the question of the canal as a loading and docking area for the canoes up to the imagination of the visitor. I would think that this is an important enough feature of this local to warrant further science in an effort to provide a more definitive interpretation. In the east west ditch (the main ditch that empties into the Wye) large hollowed out logs were found which may have been used to concentrate the river flow to turn a mill wheel. These logs are massive and are stored at Ste. Marie. They were preserved with creosote. The locks were used to regulate the flow of this water. There was also a smaller, secondary ditch parallel to it which may have been used for toilets- having the sewage wash out into the river. The reconstructed site has the north south ditch in the larger European compound (North Court) east of the stone work, while Hallen's map and others of his time have sketched the ditch to the west of the stonework (running through the reconstructed Blacksmith shop). This was the ditch that brought the water from the hill. The reconstructed ditch did appear in later sketches of the ruins- but it may have been dug by settlers and not part of the 17th century mission. The reconstruction team filled in the westerly north south ditch (original) and reconstructed the easterly ditch (later feature). The idea of the mill wheel at Ste. Marie was first entertained by Fr. Denis Hegarty SJ, who worked with Jury and later found the grave of Brebeuf in 1954. Jury was not invited back in 1952 by the Jesuits to continue his work, however the government had him in charge of the reconstruction. Even the reconstruction does not follow his own arcaheological notes, especially when it comes to the location of fireplaces, etc.